Yesterday wasn’t my favourite day ever. The afternoon took a bit of a turn for the worse. To cut a long story short I had to take my Mother in Law to have her elderly cat put to sleep at the vets – it was the right thing to do but didn’t make it any easier and she was distraught. Not the most pleasant afternoon I’ve ever had, if I’m honest… Rest in Peace, Misty. By the time I got back I was feeling pretty drained and it was dark (I love the clocks going back because I feel like I get back the hour the world stole away from me 6 months ago but have to say pitch black before 5pm isn’t great.) I’d planned a run but with it being Halloween and the threat of bloody killer clowns roaming the streets I was a bit nervous about going out in the dark on my own! I was feeling pretty up for it though and that doesn’t really happen often so I went with it. 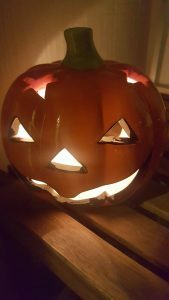 It turned out to be the best night to go in the dark because of the amount of people around actually, loads of kids dressed as pumpkins and witches and parents waiting at the ends of pathways for them to load up on sweets. There was one spooky stage where I was about 3 miles from home and fog was just settling, super low so I was running through it. The temperature dropped dramatically and it was pretty weird but pretty cool! So many houses were decorated for Halloween too! Maybe I haven’t noticed in the past but there seemed so much more of an effort gone into this year. Loads of carved pumpkins, loads of orange lights, cobwebs, scary figures all outside people’s homes! I don’t remember anything like that when I was younger. Anyway, I don’t know if it was the Halloween distractions or what but I managed 6 miles! 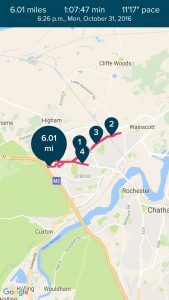 My longest training run by far! I was on such a massive high when I got back, it was so worth going. My knees are a bit sore today so will take today as a rest day and get back on it tomorrow – think it’s about time for a bit of sprint training….. now that’s something to look forward to…. Because of the cat situation I only managed to grab a few bits from the supermarket and somehow managed to get parts of all recipes but nothing that actually made an entire recipe! So clever. It was tempting to suggest we just went and grabbed something out but I resisted and adapted one of the recipes on the meal plan to what we did have in the fridge. It should have been a Jamie Oliver recipe from his book Super Food Family Classics (click the link to have a gander at the book on Amazon) – Sicilian Fish Traybake on page 158. It ended up still a fish traybake but a little different! I chopped 4 spring onions and 2 celery sticks into thin strips. 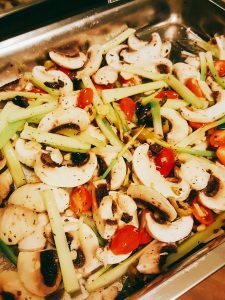 I also chucked in about 8 thickly sliced mushrooms and about 12 halved cherry plum tomatoes. I seasoned with salt and pepper and some dried oregano. I roughly chopped about 10 mixed green and black olives and threw those in as well, along with a small handful of pine nuts and a small handful of flaked almonds and drizzled the whole lot with olive oil. It was chucked in the oven at 180 fan for 30 minutes. In the meantime the water was boiling for the brown rice. We have used brown rice for years instead of white, for 2 reasons. Firstly it’s better for you and less bloaty too. Secondly I cannot cook white rice to save my life. It always ended up a stodgy white starchy gross mess, so I gave up, tried brown and will never ever go back. 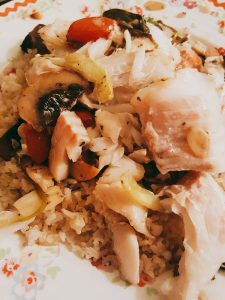 The rice takes 20 minutes so when that went on we chucked some haddock fillets skin side up on top of the roasted veg, seasoned them a bit and squirted them with the juice from half a lime I had left over from the weekends Halloween party Coronas…. To serve we plated the rice first, veg on top, then the haddock. The skin was crispy if you like skin but we don’t so we peeled it off…I know right, and we call ourselves foodies…. It was amazing. I don’t even know if I want to try the proper recipe (I will Jamie, I promise) as this was so damn good. Anyway, give it a go, adapt it to what you have, and love it as much as we did 🙂 Hope you all had fab Mondays!